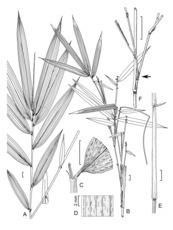 Hill cane differs from the other two native North American bamboo species — commonly known as switch cane and river cane — in an important way: It drops its leaves in the fall. There are 1400 known species of bamboo. Of those, about 900 are tropical and 500 are temperate. The bamboos of North America are found in the Eastern and Southeastern United States, from New Jersey south to Florida and west to Texas. River cane (Arundinaria gigantea) occurs in low woods and along riverbanks. Switch cane (Arundinaria tecta) is found in non-alluvial swamps, moist pine barrens, live oak woods and along sandy margins of streams. Written from a news release by Iowa State University .